Canada selected the F-18 in 1980 to replace the ageing CF-104s and CF-101s which until then had born the brunt of the RCAF's fighter work. The CF-18 differs from the US Navy standard by mounting a large searchlight on the nose just forward of the portside LEX, which is used during night-time interceptions for positive target identification. Most of the time the light is used to annoy Tu-95 crews who "stray" into North American airspace. Beginning in 2002, the CF-18 fleet was upgraded and is now maintained to a standard which is functionally identical to the US Navy's F/A-18C. Upgraded CF-18s may be visually identified by the 'bird slicer' IFF antennae mounted immediately in front of the windscreen. 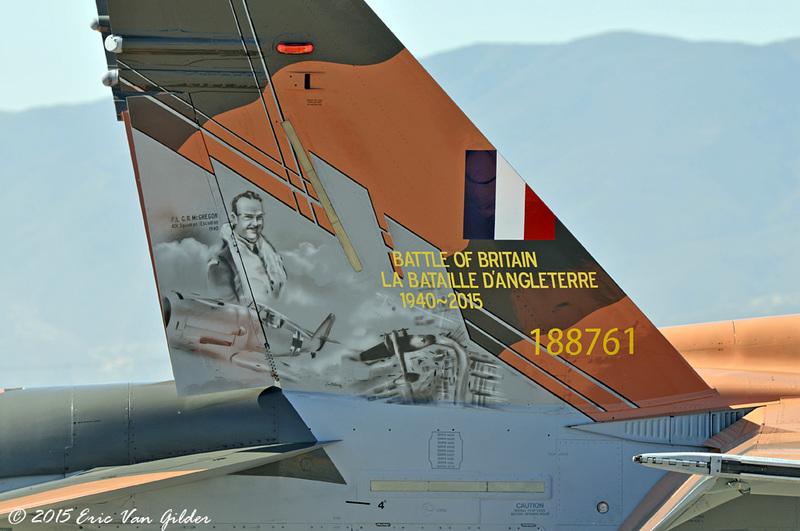 In early 2015, 401 Squadron painted aircraft 188761 to commemorate the 75th anniversary of the Battle of Britain. While not entirely historically accurate, the scheme harks back to the Hurricanes the squadron flew during the battle as the RCAF's only fighter squadron to take part in the action. This kit combines the plastic of Academy's new F/A-18 with Canuck Decals' 401 Squadron Special markings to make an excellent and exciting model. The detail is state of the art, and combined with Canuck Decals' outstanding markings makes this the best CF-18 model available today. The fuselage is made up of two major parts; top from exhausts to nose cone and bottom up to the intakes. The lower nose is done in five pieces; left and right sides, the bottom including the wheel well, lower forward fuselage and the radome. This is a little fiddly, but it allows for some nice detail. The hole for the searchlight must be opened up to accommodate the lens cover. The cockpit part has two cockpits, and in this model the rear cockpit is left empty to be covered over by the canopy mount. The cockpit detail is nicely adequate for the scale, and little or nothing is needed in the way of aftermarket to make it sparkle. The canopy and airbrake may be posed open or closed. Exhaust nozzles are only provided in the closed position, which is common for parked F-18s. Each wing is one piece with the flaps and slats moulded in the up position. While this is not accurate for a parked F-18, it definitely simplifies the build. Flap hinges and pylons are provided. The CF-18's characteristic fins are provided with the correct number of RWR and ECM fairings on the trailing edge. The rudders are moulded in place, but the stabilators may be posed as the modeller wishes. The fin root reinforcements are provided as separate parts. Laser guided bombs, tanks, Laser designator, ECM pod, Sparrows and Sidewinders are provided, but since this is a display aircraft, the only things it should be carrying are fuel tanks and a travel pod. If you wish to portray it in its airshow configuration, it should be left completely clean, without any pylons. I don't compare models to drawings or published measurements. When assembled it will look like an F-18. One set of markings is provided for 401 Squadron's 188761 in its 2015 Battle of Britain commemorative scheme. The custom-mixed colours of the camouflage scheme negate finding options out of the bottle. The painting instructions have a recipe for mixing Tamiya colours. The main airframe greys are standard fare for anyone who's done a CF-18. Since the review kit is not readily available due to being packed for a move, I'm substituting photos of the previously reviewed 1/48 sheet. The artwork is the same, although the sheet layout is slightly different. 188761 displaying its plumage to advantage against a clear blue sky. This is a good kit, but not suitable for a beginner. You should have a few models in your experience and be happy with putting slightly fiddly assemblies together and custom mixing paints. This and all other Canuck Models products may be purchased directly from the Canuck Models website. 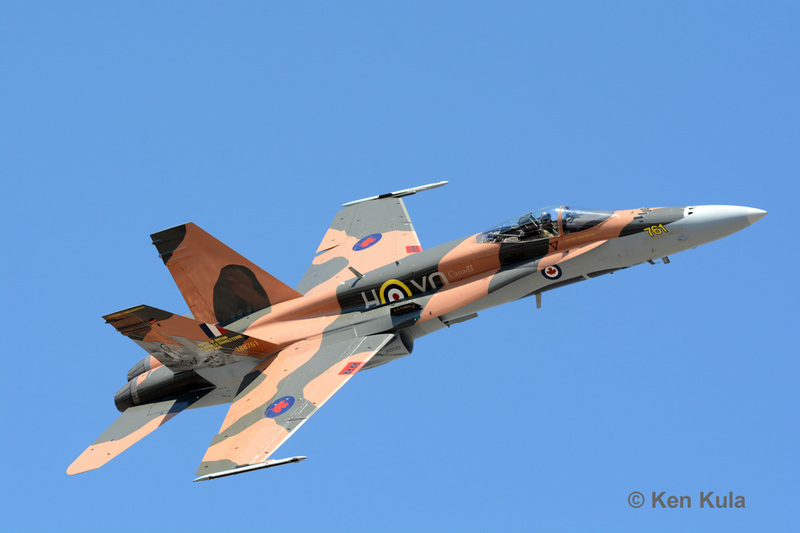 Highs: This is a proper and accurate 21st Century CF-18 in a very distinctive colour scheme. Lows: Flaps and slats moulded up, somewhat fiddly assembly. Verdict: This will be an easy build for the experienced modeller. Recommended. Are the colors of the camo very different from the original Earth and Dark Green used by RAF? I'd assume the RCAF was trying for simmilar colors, so you could use the usual fare fora wartime model and it look right? Unfortunately the 401 Squadron paint shop custom mixed the colours and they're not at all like the wartime RAF colours they're supposed to resemble. The brown is much more yellow-tan, and the green is more olive. The mixing recipe results in a match to the actual 2015 F-18, not to a 1940 Hurricane. THIS CANADIAN MODELING BRAND IS FIRST TO MADE ONE SAMPLE OF THE "CF-18A-HORNET". IN 1/72 SCALE.